Luxury new villa, with private pool, on a stunning location with breathtaking sea and mountain views. The Villa is split into (2) self-contained apartments. This advert is for the lower level only, this living accommodation, terrace and pool are on one level. The upper level is not occupied during the renting period. A fabulous location on the Costa Blanca, this superb villa is situated in the exclusive surrounds of La Cumbre del Sol and offers spectacular stunning panoramic views over the sea, surrounding countryside and mountains. This is in an ideal location for peace and tranquility, the area has been awarded with the best climate of Continental Europe by the World Health Organisation and is ideal for all year round visiting. Please note that although the villa is on one level once inside, it is accessed by some steps and unfortunately would not be suitable for mobility impaired guests. The various terraces around the villa includes also a covered terrace and is designed to make the most of the south aspects for year-round warmth and enjoyment of the fabulous views over the sea and mountains. This larger than usual terrace incorporates the 8 x 4m swimming pool (all over 1.30 m deep) with roman steps. The terrace furniture consist of 4 sun loungers plus 2 parasols and 2 sets of dining furniture for 4 each, along with the BBQ make those glorious Spanish summer evenings a real pleasure. The open lounge / dining area has picture windows and patio doors with blinds and mosquito nets, which are designed to maximize light and sea/mountain views. Facilities include full air-conditioning and or heating, 2 sofas (3-seats and 2-seats), dining area for 4 people. The TV incorporates Dutch, German and English channels by 2 satellites. The kitchen is fully equipped with dish washer, cooker, oven, microwave, fridge, freezer, kettle, coffeemachine, toasting roaster. You will find a washing machine, iron and ironing board in the scullery. Everything we could think of (for a self-catering holiday) to make your stay as enjoyable as possible! (Indeed our guests have been so impressed that they have already booked again for next season). All 2 bedrooms have quality beds with air-conditioning along with plenty of wardrobe space all add to the comfort of your stay, all windows have blinds and mosquito nets. A hairdryer is also available. Master bedroom with double bed (size 1.60 x 2.00 mtr) and luxury bathroom with shower and WC. Bedroom with Twin beds (size 80 x 1.90 mtr) and luxury bathroom with shower and WC. Change over day is normally Saturday, though we are able to offer flexible arrival/departure days depending on availability. Villa is available from 16:00 on day of arrival, and must be vacated by 10:00 on day of departure. Bed linen and bath towels at 15,00 EUR per person, which includes bed linen, 1 big towel, 2 small towels, 1 beach towel each and 4 kitchen cloths per house, are supplied by our property management company in Spain. End cleaning charge is 70.00 EUR these charges will be deducted from your security key deposit. Key account deposit 200 EUR is required on hand over of the property keys in Spain. They balance of your cash deposit is returned to you on your departure. The Resort has one shopping centre, Commercial Center Adelfas a 6 minutes drive, with a supermarket, restaurants and a Chemist. Playa del Moraig (5 minutes drive) a nice beach with a picturesque cove used almost exclusively by the residents of Cumbre del Sol, and has a car park. Alternatively the beaches of Moraira or Javea are both just a 15 to 20 minutes drive, we recommend visiting all the surrounding area and sampling the beaches, bars, restaurants and markets. Local markets have a great source of clothing, shoes and leather goods and in coastal resort towns nearby you will find many elegant boutiques. Whilst you will be staying by the sea with some of the finest beaches, you will be only 30/40 minutes drive away from the mountains and wonderful scenery and walks. The local railway (The single-track running from Denia to Alicante) stops at nearby Teulada & Gata providing a delightful ride to north or south (Denia or Altea, Benidorm and Alicante). MORAIRA (15 mins drive): Formerly a small fishing village (some of the old parts still remain) which has developed in to a charming, up-market little town retaining a village atmosphere. Small, colourful streets, pavement cafes, a pretty marina, and a wide expanse of sandy beach in a sweeping crescent. Excellent selection of bars and restaurants, a lively shopping area, and a market on Fridays. Just 1.5 kms from Moraira lies the picturesque bay of EL PORTET with a beach of fine sand ideal for small children. Surrounded by steep hills dotted with villas, its a real artists paradise. BENITACHELL & TEULADA (10 & 15 mins drive): If you want to get the feel of a typical small Spanish town, take a walk around both these places. The narrow streets are full of pretty houses opening directly onto the road, and the colourful market in Teulada is well worth a visit. JAVEA (20 mins drive) is our nearest large town which has preserved all its charm, and has 3 areas, the unspoilt old town, harbour area and El Arenal with its sandy beach, all areas have an abundance of shops and restaurants. GATA DE GORGOS is located about 8kms inland from Javea, and is a small town well known for the production of cane goods. The town has many shops which sell cane ware and souvenirs. 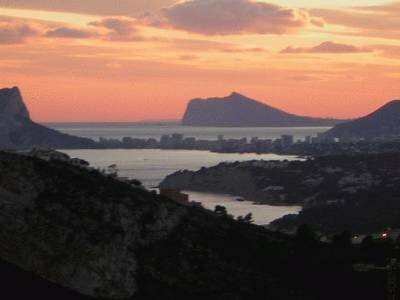 CALPE (30 mins drive): This is where the Rock of Ifach is located, which you can see from our villa. There is a footpath up to the top of the rock, which is also a bird & wildlife sanctuary. Also in the town are the Las Salinas salt lakes, where flocks of pink flamingos regularly congregate. Calpe has sandy beaches and a charming fishing port that is renowned for its fresh fish restaurants. DENIA (30 mins drive): Take the scenic route via the mountain roads of the Montgo National Park. Long sandy beaches, a castle proudly surveying the town & port. The harbour has an important Ferry Terminal serving the Balearic islands and a new impressive modern yacht marina, many harbour-front restaurants, and shady tree-lined avenues full of shops & pavement cafes. An interesting "old quarter" is to be found in the castle area. Apart from the above, there are many SECLUDED BEACHES, WALKS, & SCENIC VIEWPOINTS to enjoy close by. EATING OUT: Apart from the huge choice of restaurants in local towns & villages, there are many rural restaurants to try - some situated very close to Cumbre del Sol. They offer set menus (including wine) at ridiculously low prices. The national dish "paella" originated in this area, and wines of the region are excellent and inexpensive. Boat hire, water skiing, jet skiing, wind surfing, scuba diving. - Available on the larger of the beaches in Moraira and Javea. Fishing - Sea fishing available in Moraira - tuna, dorado, baracuda, conger, blue fish, spear fish and more... The tourist information board office in Moraira town can help you book. Tennis available at La CUmbre del Sol behind Commercial Centre Adelfas, Golfclub Javea and Sol Park Moraira. Karting is available near Denia an Moraira. The Safari Animal Park nearby Pego, highly recommended for children. Benidorm: Terra Mitica’s Spain’s largest theme park. The park features ancient Egypt, Greece, Rome, Iberia and the Islands and lost civilizations apart from thrill rides and great shows and street entertainment. Benidorm: Aqualandia Water Park is a big watermark with a wealth of different slides and pool areas all within a beautiful garden. Benidorm: Mundomar features a marine life and animal park with all kinds of colourful creatures. Benidorm: Terra Nature (Zoo, which is highly recommended). Valencias impressive City of Arts and Sciences has the Europes largest Marine Park housing over 45,000 animals of 500 different species in the numerous underground aquariums. Javea Golf Club (Javea) Tel Number 965792584 Located close to Javea. A 9-hole course par 72. Ifach Golf Club (Moraira) Tel Number 966497114 Situated in Moraira. A, 9-hole course par 60. La Sella Golf Club (Denia) Tel Number 966454252. A 18-hole course par 72. Oliva Nova Golf Club (Oliva - north of Denia) Tel number 962257666. A 18-hole par 72. Don Cayo Golf Club (Altea) Tel number 965848046 A 9-hole course par 72. Real de Faula Golf Club (Benidorm) Tel number 966813013. A 18-hole course par 72 and a 18-hole course par 62.